Of the 2,147 miles that comprise the AT, the Great Smoky Mountains National Park accounts for 71 miles, including the highest peak along the trail (Clingmans Dome 6,643’). Of the National Park’s 848 miles of trails, the AT is by far the most popular. The Trail through the Smokies also has the most rainfall and snowfall on the A.T. in the South, and many hikers are caught off-guard by the snow and cold temperatures at high elevations. The temperatures at 5000 feet can be 10 to 20 degrees cooler than the valleys around Bryson City. 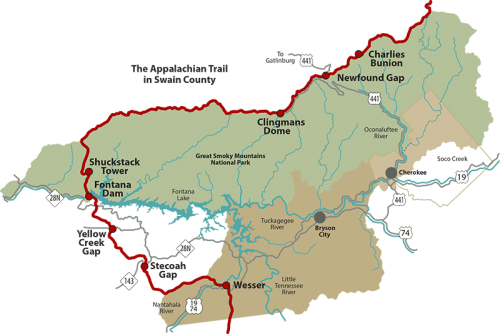 Directions to Newfound Gap — From the Oconaluftee Visitor Center in Cherokee, take US 441 (Newfound Gap Road) 16 miles north to the Newfound Gap overlook and parking. Take the trail east. You Read The Book, You Saw The Movie. We Have The Real Thing. In the film “A Walk in the Woods”, Robert Redford & Nick Nolte star as old friends who — ready or not — decide to hike the AT. Based on Bill Bryson’s bestseller, the movie co-stars Emma Thompson, Mary Steenburgen, Nick Offerman & Kristen Schaal.